Dogloveit is a registered trademark. We do want to provide the best products and service to our customers. Sizing for each dog is unique. Similar to our clothing and accessory, medium size from one designer is not the same for another. So please check with the size chart carefully so that you won’t get the wrong size. 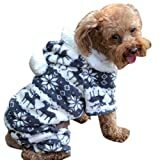 This entry was posted in Dogs and tagged Bocideal, Clothes, Coat, Gray, Hoodie, Jumpsuit, Puppy, Warm by One Boutique. Bookmark the permalink.